According to the World Health Organization, lower back pain is one of the top 10 health conditions across the globe and has a lifetime prevalence of as much as 70%. This means 7 out of 10 people will experience an episode of back pain at least once! At Integrative Health and Sports Performance, our chiropractor team works with people every day struggling with this common and broad condition. If you live near the Fairborn, Miamisburg, Bellbrook, or Dayton area and are currently living with back pain, we encourage you to connect with us for help. Back pain—which is often accompanied by other signs and symptoms including stiffness and arm or leg pain, numbness, and weakness—can come on due to a number of conditions. 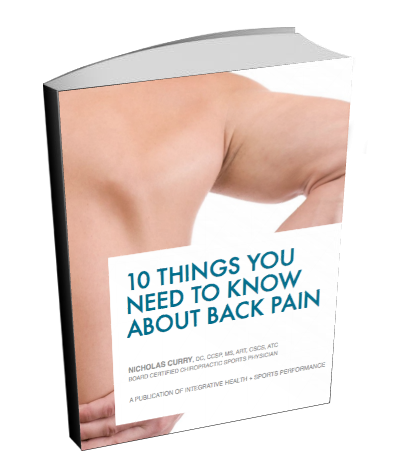 If you have back pain, there may be an obvious reason or a combination of factors. Sometimes, however, it's not clear what's causing your back pain. Fortunately, these so-called "idiopathic" cases of back pain can and do respond positively to conservative and holistic care techniques, including those we provide at our Ohio chiropractic clinics. So many different natural techniques are available to you for your back pain—we encourage you to explore them with one of our chiropractors before seeking more invasive help! Our techniques are individually implemented with the goal of reducing inflammation and pain, improving tissue health, and restoring strength, endurance, alignment, and overall function of your spine. Non-invasive and drug-free, our services are safe for people of all ages. Is Your Back in Pain? Put a natural end to your dysfunction. Contact Sugarcreek Chiropractic at 937-848-8500 to schedule an appointment with a chiropractor in your area. We serve in Fairborn, Bellbrook, Miamisburg, and the Dayton area!